A Thursday evening here in the countryside, its been raining all day pert near, which is very unusual in itself in mid Minnesota at the end of December. Tomorrow those that supposedly know are talking snow and wind. Well, bring er on I say, (besides, what can I do about it), and I’ll clean up anything that needs cleaning on this place. This past Monday we went to a movie, which is really saying something, because I just don’t get out and go to movies all to often.The time span between movies is measured in years for me. But a few times in a life time there comes a movie that will pull me to town and give up an evening at home. Went and seen True Grit and now I don’t have to see a movie for at least ten more years the way I figure it. Son of a gun, that movie was custom made for me! Our pastor at church told me that I had better go and see it, because at the movie our pastor couldn’t stop thinking that this is Tom’s kinda stuff! Right on! Now what would a grizzled, drunken U.S. marshal have in common with a fella like me. Well, I sure ain’t perfect either! Far from it. But ol’ Rooster, he had a good heart, even with all his shortcomings. He helped that girl right up to the end, especially at the end to save her life. He was a man hunter, but he had a soft side. But with that soft side was some gritty determination that many do not have. Now, I’ve been thinking about this all week long after seeing that movie, (and yes, I did see the original eons ago and liked it, I just like this one better for some reason). Now of course it doesn’t hurt in catching my attention to throw in a Bible verse in the first scene of the movie and end the movie with a hymn. It truly reminds me of ministry though. In evangelism, that’s what they label me as nowadays in the organization that covers our church, a fella is more like a man hunter than a sheep herder. I remember a couple months ago I was feeling a little down and out doing cattle feeding one morning during deer hunting, having a pity party of sorts. feeling sorry for myself that I couldn’t take a few days off to go shoot some government goats. I musta been muttering out loud, talking to God, and boy did I get the answer right quick. That quiet still voice told me, “you have a license, and it ain’t for deer, its for men”. Now I tell you, when a fella has these kinda moments they stick with you! OK, I said, and I must admit I understood perfectly. 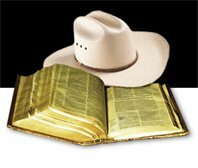 How God can take a simple, sometimes grubby cattleman and use him for hunting down folks for the Kingdom of God. In the next couple weeks He sure confirmed it because men were brought into the kingdom when ever we headed out hunting. And a fella just has to hunt em down, God cleans em! This New Year I’m dedicating to a full years worth of man hunting. Just like a bounty hunter, track em down, follow leads, do what ever it takes. I ain’t the best person on earth when it comes to church stuff, to put it bluntly I do get bored with a bunch of bleating sheep. And I must admit that the Bible really pegged it when it compares church folks with sheep. I raised enough of them things to know what the Bible is really talking about! But I won’t get into that here. I just want to hit the road and do what I was called to do, hunting. It ain’t easy sometimes, it takes some grit, but there is nothing else on this earth that makes me feel more alive than this. Been a while since I wrote here. Where does the time go? Tonight the wind is howling outside, cold out, snow is drifting and I’m staying put in our nice warm house. Fired up the outdoor wood boiler good and full and that should take care of that till morning. The cattle are taken care of as good as I can. Nothing more I can do for them. Fed them till they couldn’t eat any more. Bedded them down in the loafing barn and now they’re on their own. In reality it isn’t that bad out, it could be thirty degrees colder with the same wind. Now that starts to get tough! So tonight I sit a few moment and sip a hot cup of coffee and gather my self back together after another rough Saturday. Winter time means some long evenings in the house, which I’m not complaining about by the way. In the north country the days are really long in the summertime and a fella works those hours too. Now is the time to recoup some of that time spent working all spring, summer and fall. Spend the evening looking through the newspaper called “Western Ag Reporter”, checking out cattle prices, trends, and news in the cattle business. Reading the old stories of days gone by, checking the advertisements of the seedstock people for the new bloodlines of bulls. Read some of the comical articles that give a person a belly laugh. All in all, I enjoy evenings in a warm house. And there’s planning to do, there’s figuring out when to sell the backrounding calves, there’s grain to sell soon to build up a money supply for this next year’s crops. Taxes are coming soon too, although I usually put that off as much as I can. I remember a few years back when I read about a rancher in Oregon that also preached the Gospel. Now I was really spiritually sheltered, or some could call it flat out stupid, but I always thought a person had to be a clean handed, never do any work of any kind type of person in order to become a preacher. But I read about that rancher, and remember seeing him cutting hay with a team of horses and a horse drawn mower and it told how he spread the gospel in his area. Now that caught my eye, so much that in fact I will never, ever forget it. That moment, reading a ranching magazine is truly the moment I knew that I could do something similar. I had always thought that there were two types of folks as far as Christianity was concerned. Clean handed preachers and pew sitters. And I always figured if you didn’t go to some bible college as a young person you ended up being a pew sitter and that was that for that. You found your place and stayed in it. Thanks to a ranching magazine things started to happen around here. Now this way of life is the only one I truly do, cattle raising, and over the past few years I have discovered that it can blend with preaching the Gospel. A while back a person that I was leading to Christ was somewhat shocked. He knew I was a cattleman, but couldn’t believe that I was a minister too. I guess he thought like I used to think! But the job got done regardless and he accepted Jesus, but I know he was thinking about that cattleman preacher for a few days! Its the Father’s will that everyone that looks to the Son and believes in Him shall have eternal life. That’s all a fella has to spread. The world is hungry for the truth, for something lasting. And the Gospel sets people free. I don’t hammer them over the head with it, just tell em, and let God do the work. If I try to do the work I just get in the way.